Simon & Schuster, 9781476777092, 336pp. In this poignant, hilarious, and deeply intimate call to arms, Hollywood's most powerful woman, the mega-talented creator of Grey's Anatomy and Scandal and executive producer of How to Get Away with Murder reveals how saying YES changed her life--and how it can change yours too. She's the creator and producer of some of the most groundbreaking and audacious shows on television today: Grey's Anatomy, Scandal, How to Get Away with Murder. Her iconic characters--Meredith Grey, Cristina Yang, Olivia Pope, Annalise Keating--live boldly and speak their minds. So who would suspect that Shonda Rhimes, the mega talent who owns Thursday night television (#TGIT), is an introvert? That she hired a publicist so she could avoid public appearances? That she hugged walls at splashy parties and suffered panic attacks before media interviews so severe she remembered nothing afterward? 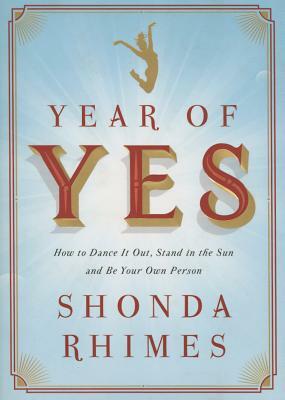 Before her Year of Yes, Shonda Rhimes was an expert at declining invitations others would leap to accept. With three children at home and three hit television shows on TV, it was easy to say that she was simply too busy. But in truth, she was also afraid. Afraid of cocktail party faux pas like chucking a chicken bone across a room; petrified of live television appearances where Shonda Rhimes could trip and fall and bleed out right there in front of a live studio audience; terrified of the difficult conversations that came so easily to her characters on-screen. In the before, Shonda's introvert life revolved around burying herself in work, snuggling her children, and comforting herself with food. And then, on Thanksgiving 2013, Shonda's sister muttered something that was both a wake up and a call to arms: You never say yes to anything. This poignant, intimate, and hilarious memoir explores Shonda's life before her Year of Yes--from her nerdy, book-loving childhood creating imaginary friends to her devotion to creating television characters who reflected the world she saw around her (like Cristina Yang, whose ultimate goal wasn't marriage, and Cyrus Beene, who is a Republican and gay). And it chronicles her life after her Year of Yes had begun--when Shonda forced herself out of the house and onto the stage, appearing on Jimmy Kimmel Live, and giving the Dartmouth Commencement speech; when she learned to say yes to her health, yes to play and she stepped out of the shadows and into the sun; when she learned to explore, empower, applaud, and love her truest self. Yes.